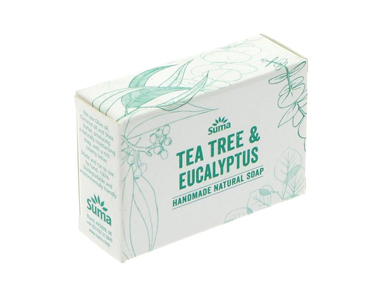 Buy Suma Tea Tree, Eucalyptus & Nettle Soap in the UK from our online shop or directly from our independent Scottish store. This is a fresh and soft soap, with added nettle leaf to soothe tired skin. A lovely green flecked bar. Tea tree renowned for its superb antiseptic qualities, and eucalyptus for its antibacterial action, combine to create a wonderfully aromatic soap for deep cleansing. This is a fresh and soft soap, with added nettle leaf to soothe tired skin. As official Suma stockist, we sell genuine Hand Soap Bars directly from our shop in Scotland and online throughout the UK. Where can you buy real Tea Tree & Eucalyptus Soap safely online? If you are wondering where you can buy Suma Tea Tree, Eucalyptus & Nettle Soap safely online in the UK, then shop with us. We are an actual health foods shop; with real people selling real foods and products. Our award-winning independent shop is located in Stirling, Scotland since 1976. You can buy our Beans, pulses, grains, flours, seeds and dried fruit and other genuine Hand Soap Bars in store or safely place an order with us online or over the phone. Tea Tree & Eucalyptus Soap - Suma Tea Tree, Eucalyptus & Nettle Soap in Hand Soap Bars and Hand Soaps.